I work on my own in a small workshop in Nottingham, England. ORD are my initials. I'd always enjoyed crafts of all sorts and about 10 years ago I was inspired by a Farrier's demonstration to have a go at forging some metal in the fashion of a blacksmith. 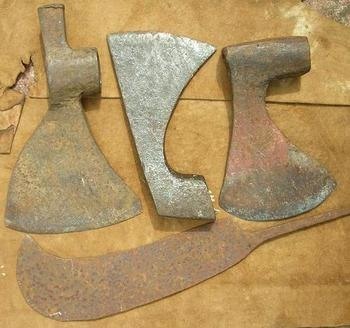 I bought an Anvil from a scrap-man, made a coal-fired forge from an industrial hair drier, a steel tube and a massive rusty lathe chuck as a tue iron and began hammering pieces of heated metal. 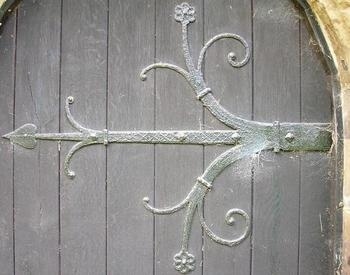 My interest and intrigue grew faster than my ability as I began to understand more about forging iron and started to see old ironwork in a new light. 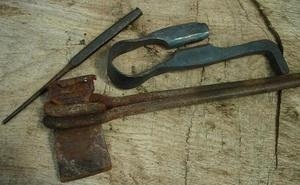 I looked for an apprentiship with a blacksmith for a while, but with no previous experience I had no luck. I taught myself to make poorly formed decorative curls, blacksmith's tongs and knotted steel rods etc... 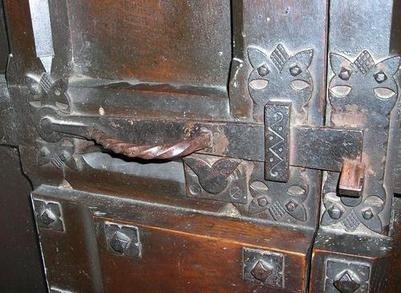 I find inspiration in Latches and hinges on church gates and doors, axeheads, and old tools pieces of forged iron and steel in general. They have forged features which give some insight to how they were made. In the beginning I had little success making anything decorative that looked how I wanted it to. But this is the challenge, to control the metal and to move it to where you want it. A Master-blacksmith moves the steel like it is plasticine and I aspire to learn this skill. I had more success making knife shapes but they were useless as knives. Because I had great difficulty making the steel keep to the plan I had for it I had more enthusiasm in making things that were useful in some practical way and less ornamental so I began to learn to make functional knives and tools. At about this time I discovered the world of custom-made knives and after seeing pictures of knives by various bladesmiths something made a connection and inspired me, I knew what I needed to do. You will find links to see some of my favourite knives in the 'links' section. Since the first, years ago, they have come on a long way. I have learned from wherever and whoever I can. For a time as a hobby and nearly 3 years full-time i've been in pursuit of the skills to make blades better than my previous blades. I do my best to make the best knives possible within the confines of my basic workshop. I've learned lots from books, my mistakes and experiments and using the knives I have made. I constantly try to find better ways to get the same or an improved result, a faster or neater way to forge or a more accurate way to heat-treat. My aim is to make tools that are satisfying to use, unique, and perform well at what they were meant for. This is important to me as it is uncommon to find good honest quality in many products and I want you to enjoy using and owning the tools I make as much as I enjoy making them. Much of what i've learned in making knives can be used to make other things, I also make corkscrews and small axes, and many of my own tools for forging. I make the knives from the raw materials by hand, I enjoy the direct contact with the work-piece that 'hand-made' methods give me. In turn my products have a more organic appearance along with greater character than their machine made counterparts. None of the parts are bought in to save effort and time. I both buy new and salvage materials: brass, copper, iron, steel sheets, rods and tubes. The blades are hand forged from high carbon steel which are either bought new type O1, W1, W2, Silver steel or from old and otherwise useless files that were made from genuine Sheffield made tool steels. I use these high-carbon low alloy steels because they make excellent easily sharpened blades and they may be hardened and tempered very accurately by traditional means, without a temperature controlled furnace or sending the blades off to be heat treated. I like to make the whole knife from begining to end myself. 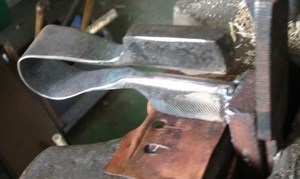 Recently I have used only Silver-Steel or Stubs steel for blades. This is a old grade of tool steel originally manufactured in sheffield and used by engineers for tools which had to be exceptionally hard. 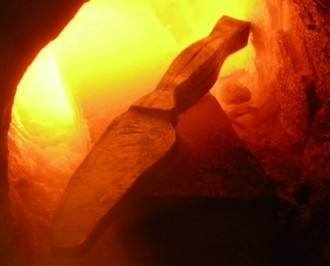 Through hard work I have found a method of heat-treating this steel to obtain a very fine grain and edge holding ability and 'feel' identical to the tools manufactured by the old methods. The knives are capable of taking and holding a true razor edge. A good deal of the British wood I cut and season myself to get the best features in the wood such as the ripples found in the grain at branch junctions, burr and spalting. Tropical wood that I use are mostly re-claimed pallets and furniture and generously donated off-cuts from wood-turners. The Antlers are both dropped naturally by the deer and as by-product of sustainably managing British woodland. I use antler from Red Deer, Roe, Fallow and Sika. For sheaths I use 'vegetable' tanned leather as is can be soaked to be pliable, worked and moulded to the shape of the individual knife and then dyed to any colour. 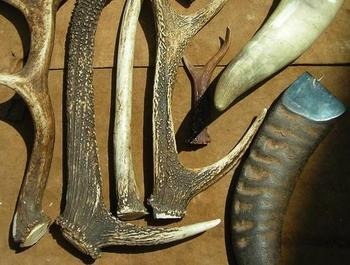 Below (left to right) are Deer antlers from Fallow, Red, first year Red (spiker), Sika, Roe, Cow horn, Indian Water-Buffalo. I use a 'venturi' propane forge to heat the Steel and Iron, it is made from simple scrap parts with a clay lining and ceramic wool insulation. It suits my needs perfectly as it only needs a cylinder of propane to run. The jet of gas comes from a mig-welder tip, drags in air by it's momentum and the both mix on the way down the tube into the furnace. I made this forge for small blades. 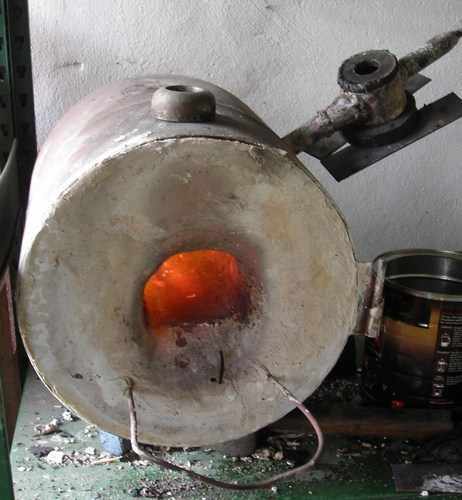 It uses a small amount of propane to keep it up to temperature and it generates an even heat that radiates into the blade from the insides of the furnace. I make my maker's mark with a etched stamp. Some knives are etched with the customers initials or a decoration. The etchingis done by hand using a traditional tar/paraffin wax ground and is scratched through with a stylus. The exposed steel is then etched away with ferric chloride or Nitric acid. I make the etch deep for a better and permanent effect.